Trail Weight, Packed Weight, Fly Weight, What? One of the most frequently asked questions the folks at MPGear hear is, what is the difference among the three weights listed for one tent: trail weight, packed weight, and fast fly weight. Tent manufactures, such as Big Agnes and MSR supply this data to the diligent consumer to aid in good product research. Trail Weight/Minimum Weight refers to the poles, fly and tent body. Packed Weight includes poles, fly, tent body, stakes, guy lines stuff sack, instruction, and packaging. 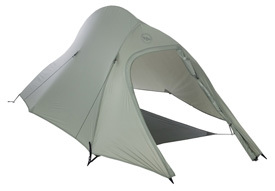 Fast Fly Weight refers to the poles, tent fly and accessory footprint. Pictured is the Big Agnes Seedhouse SL1 Fast Fly set-up. And what you actually want is: poles, fly, tent body, reasonable number of stakes, stuff sack. Including packaging and instructions only makes sense if you’re concerned about shipping costs. « Vinokourov Zipps to Win!